Buenos días! Yo sigo en Barcelona disfrutando del buen clima, y con estos días de sol lo que más apetece son colores primaverales, en este caso los pastel, que van a estar muy presentes esta temporada. La falda de hoy reúne dos tendencias más: el largo midi y el tejido de "neopreno", que seguirá llevándose este verano en su versión mas fresca. Colores pastel? Faldas midi? Neopreno? Qué os parecen estas tendencias? Good morning! I'm still in Barcelona enjoying the good weather, and with such sunny days I've started flirting with springy colors, meaning pastels, which are this upcoming season highlight. This skirt brings together two more trends: midi length and "neoprene" fabric, that is staying with us this summer in a lighter version. Pastel colors? Midi skirts? Neoprene? How do you like these trends? 57 No te olvides de comentar! / Leave a comment! Pero qué guapa! Me encanta la falda, es preciosa, y el toque de color de la bufanda es genial. Disfruta tu viaje, yo tengo ganas de volver a Barcelona. una combinacion d colores pastel perfecta! This us such a elegant yet fun outfit. Love your skirt..
Me encantan los colores que llevas! wonderful colours, you look great! following you now. hope you'll follow me, too! O X A N A M.U.A Makeup Blog NEW PHOTOSHOOT! Estás genial, un look diferente sin duda! Hi dear i follow you too on GFC and Facebook! Thank you for the comment. You look great and the outfit is unique. Sure we can follow each other. You have a new follower via GFC and bloglovin. Follow back? That is such a cute outfit! Great blog! Would you mind stopping by mine sometime? Would love it if you could check it out! Me encanta la combinación de colores :) muy dulce!!!!! Would you likt to follow? Let me know! Great look! :) I'm following you now! I'd love if you started following me too! Thanks! love this outfit! you look great! amazing colours. 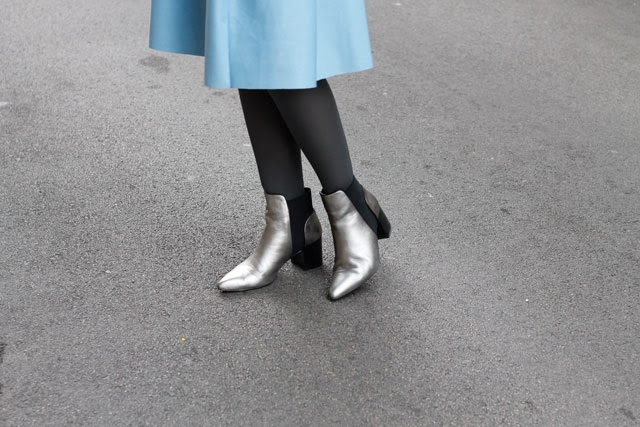 ¡Me encantan tus botines plateados!! Un beso guapa..te espero en mi blog! Wow! I really adore this outfit, all the colours completement each other so well, going to use this as inspiration for an outfit! love your scarf! so colorful & pretty. followed you dear, please follow me back. What a beautiful blog you have! I love the soft colors. You really know what you're doing. I'll be back for more tips! Thanks so much for visiting my blog and commenting! I'm now following you on GFC :) Please follow me back so that we can keep in touch. If you would also like to follow each other on Bloglovin, just follow me and I'll follow you right back! Lovely blog! Un look precioso. Gracias por pasarte por mi blog ya te sigo. Me encantaría que me siguieras. Un beso!!!! really cute look, love the colors! love the uniqueness of this outfit, the beret, the scarf and skirt :) nice post! thanks for the lovely comment on my blog :) sure we can follow each other following you now on gfc cant wait to see your amazing posts! Alter top prom dresses usually have a plunging neckline revealing a couple of your best features by bringing attention to your cleavage.